Because The Times operates a paywall, the text of Steven Maxson’s letter is copied, below, for your information. 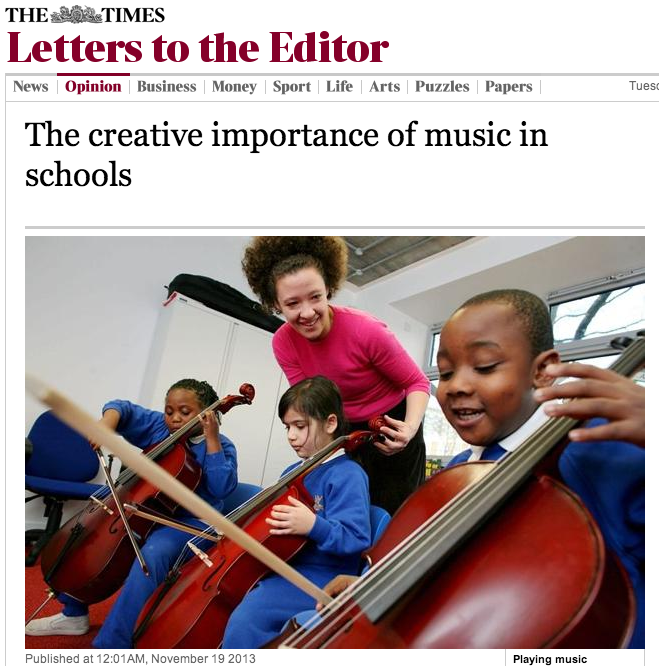 John Arkell (letter, Nov 16) asserts that a decline in the number of students taking GCSE music is as a result of the recent introduction of music hubs. Most students who took GCSE music in May would have chosen to study these courses in the spring of 2011, before the first music hubs came into force. As I know from 20 years as a teacher, including ten within senior leadership, the provision of music and arts is determined by the wishes of the senior leadership team. Senior staff who recognise the value of the arts to the wider development of their charges will ensure that music remains part of the curriculum. As an educational consultant and a professional musician, I have worked with a number of the new music hubs, some of which are working very creatively and imaginatively in building and developing local music. The fact that their funding is, in many cases, less than that given to the music services that went before, is a concern. However, many young people thrive under the auspices of the music hubs in what are very early days for the possibilities presented by this initiative.